Palynodiversity patterns and paleoclimatic changes in the late Paleozoic in Brazil and Uruguay. Cretaceous climatic reconstruction from Argentina based on palynological data. Neodymium and Strontium isotopes as source indicators for terrigenous sediments deposited in NE Brazil. 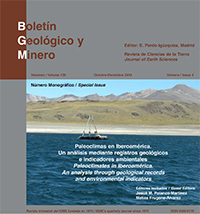 Late Holocene environmental changes from fluvio-aeolian morpho-sedimentary sequences (Santa María Valley, northwest Argentina). Holocene paleoenvironments from the Tafí Valley (northwest Argentina) through morpho-sedimentary and geoarchaeological record analyses. Comparison of elemental concentration in near-surface late Holocene sediments and precipitation regimes of the Yucatán Peninsula (Mexico): a preliminary study.